Earn $3.52 in Rewards credit (352 points) What's This? Take a bite out of the trail. Not just another adventure tire, the G-One Bite is designed for aggressive off-road riding. It may feel blocky on the road, but once you cut your asphalt-training wheels free and embrace the glory of gravel, dirt, and sand, you'll see the true strength of the G-One Bite. 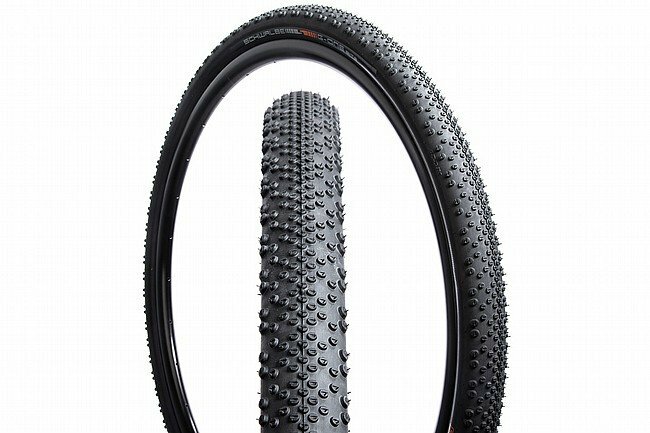 Featuring Schwalbe's TriStar rubber compound, the G-One combines traction, efficiency, and comfort, and then ramps it up to 11 with the aggressive open tread pattern. Large shoulder blocks take a bite out of the trail for rock-solid cornering, even in the loosest terrain. Available in two versions, the SnakeSkin version for added durability and puncture protection, and the MicroSkin version for reduced weight and improved performance. Furthermore, Schwalbe's Tubeless Easy technology – as the name implies – makes running tubeless tires easier than ever. With a quick, easy sealing process, you'll be experiencing the wonders of more comfortable, more protective riding. A real off-roader, this aggressive tire features an open tread pattern with strong outer blocks. SnakeSkin version with anti-puncture technology improves resistance to slashes, cuts, and punctures in the sidewall. MicroSkin version with ultra lightweight construction and improved ride quality. Tubeless Easy technology makes installation and setup easier than ever. Also available in 700c sizes.